By faith didst Thou justify the forefathers, O Thou that, through them, didst betroth Thyself afore time to the Church which was from among the nations. The saints boast in glory, for from their seed hath come a right glorious fruit, even she that gaveth birth unto Thee. O Christ God, by their prayers have mercy upon us! Ss. Peter and Paul Men’s Fellowship this Tuesday at 6.00 PM. Gathering in the temple, you pray, of course. And in praying here, you surely ought not abandon prayer at home. Therefore, it would be extraneous to speak to you about our duty to pray, when you already pray. But I do not think that it is extraneous in any way to give you two or three rules about how to pray, if not in the way of teaching, then simply as a reminder. The work of prayer is the first work in Christian life. If in everyday affairs the saying: “live and learn” is true, then so much more it applies to prayer, which never stops and which has no limit. 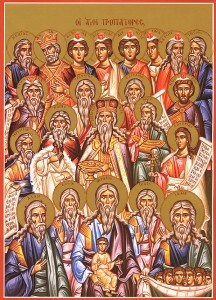 Let me recall a wise custom of the ancient Holy Fathers: when greeting each other, they did not ask about health or anything else, but rather about prayer, saying “How is your prayer?” The activity of prayer was considered by them to a be a sign of the spiritual life, and they called it the breath of the spirit. If the body has breath, it lives; if breathing stops, life comes to an end. So it is with the spirit. If there is prayer, the soul lives; without prayer, there is no spiritual life. However, not every act of prayer is prayer. Standing at home before your icons, or here in church, and venerating them is not yet prayer, but the “equipment” of prayer. Reading prayers either by heart or from a book, or hearing someone else read them is not yet prayer, but only a tool or method for obtaining and awakening prayer. Prayer itself is the piercing of our hearts by pious feelings towards God, one after another – feelings of humility, submission, gratitude, doxology, forgiveness, heart-felt prostration, brokenness, conformity to the will of God, etc. All of our effort should be directed so that during our prayers, these feelings and feelings like them should fill our souls, so that the heart would not be empty when the lips are reading the prayers, or when the ears hear and the body bows in prostrations, but that there would be some qualitative feeling, some striving toward God. When these feelings are present, our praying is prayer, and when they are absent, it is not yet prayer. It seems that nothing should be simpler and more natural for us than prayer and our hearts’ striving for God. But in fact it is not always like this for everyone. One must awaken and strengthen a prayerful spirit in oneself, that is one must bring up a prayerful spirit. The first means to this is to read or to hear prayers said. Pray as you should, and you will certainly awaken and strengthen the ascent of your heart to God and you will come into a spirit of prayer. 3. do not go on to ordinary work immediately after prayer.